My design wall is still not up but I’m hoping that that will change today. The hubby needs something for the project. Last time I linked to BOM Away Monday was last June. Since then here’s a quick update on the projects I highlighted on that post. Row by Row experience – have not done anything with it. The kits are in a box in my sewing room and I will get to it one of these days. 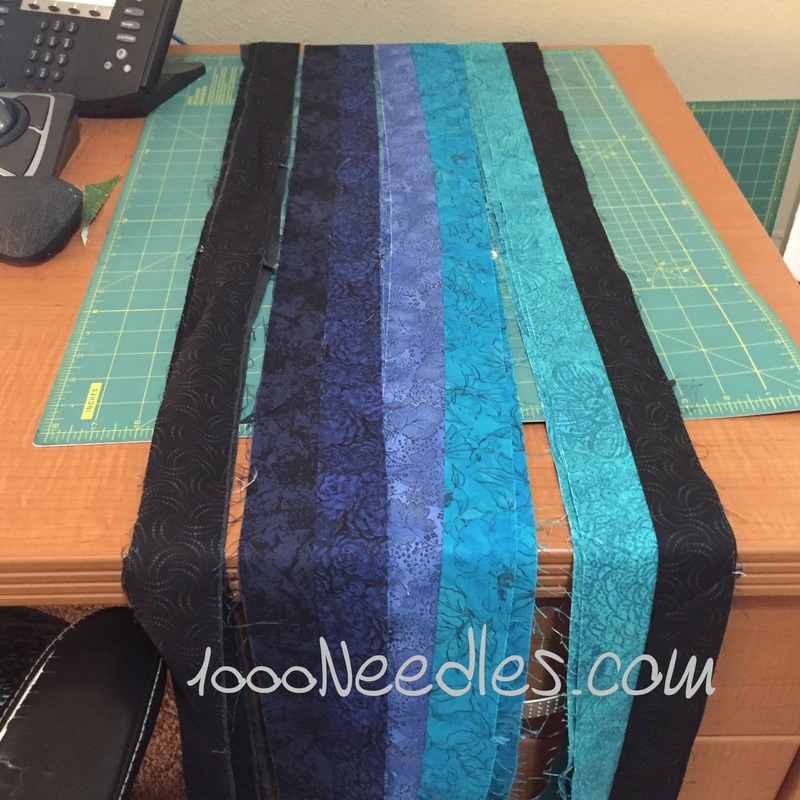 Scrapitude – This is ready to be quilted. I think I need batting but I’ll work on that once Bailey is in the living room and Tell It to The Stars is quilted. Tell It To The Stars – This is ready to be quilted to. I’ve got everything! I just need to trim down the batting and backing and get it on the quilt frame. Of course, I need to get Bailey and the quilt frame into my living room. Moon Glow – Working on getting the borders on now. Hampton Ridge – This is still in my project bag. I believe the rows are done and all I have to do is piece the rows together. Then I’ve got to get the border on. I’m not sure though and will figure it out when I’m ready to take this project out. With the way my sewing room is set up currently, I can only have 1 project out at a time. But I think this will wait until the final block for Raining Cats and Dogs is finished. I want to work on that once the borders for Moon Glow is complete. Love all those shades of blue. Very pretty. Wow, you’ve done so much since I last commented. I love the way Moonglow has turned out, though all of them are beautiful. You’ve just kept at it steadily, and what lovely things you have to show for it. I need to be more like you! Thanks Susan…it’s been hard keeping myself from starting new stuff but I’ve got a good mix of projects to jump around if I get bored. Man, it takes forever to sew borders for large quilts, doesn’t it? Not my favorite part at all.